In a television career spanning nearly 20 years and cut short only by his premature death, James MacTaggart produced, directed or wrote well over 100 individual television plays or episodes. He began as an actor before joining BBC Scotland as a radio producer in the 1950s, subsequently moving into television. MacTaggart's successful production of Jack Gerson 's Three Ring Circus (tx. 2/2/1961), the winning entry in a Scottish television play writing competition, precipitated his move to London, where he would lead the cutting edge of television drama. Three Ring Circus had included fantasy and expressionistic elements, and MacTaggart's colleague Troy Kennedy Martin later suggested that MacTaggart joined him in London specifically to pursue such non-naturalistic drama: "We were going to destroy naturalism", said Kennedy Martin , "if possible, before Christmas". Exploring non-naturalistic techniques, MacTaggart produced Storyboard (1961), a drama anthology which aimed to "tell a story in visual terms", something which television was then still learning to do. He followed it up with the similar Studio 4 (1962) and then Teletale (1963), an experimental testing ground for new directors. Between these series MacTaggart directed instalments of Z Cars (1962-78), Moonstrike (1963), and all six episodes of Alun Owen 's Corrigan Blake (1963). His non-naturalistic work continued with the six-part Diary of a Young Man (1964), a serial written by Kennedy Martin and John McGrath . MacTaggart introduced it as "a new kind of writing for television, exploring the possibilities of the medium in a rather more extreme way than we've tried before". The serial used voice-over, musical montages and sequences of still images to tell its story. This work primed him for his career-defining assignment, that of producer of the Wednesday Play (1964-70). MacTaggart took control of The Wednesday Play for its second series, rapidly remoulding it into a showcase for new and (sometimes controversially) contemporary drama, employing innovative, often young, writers and directors like Dennis Potter , James O'Connor , Ken Loach and Don Taylor . As an anthology, the series had room for all styles of production, but it's noticeable that expressionistic devices, such as those used on the early experimental anthologies and Diary of a Young Man , were common during MacTaggart's year in charge. He remained involved with The Wednesday Play even after concluding his producership, returning to direct a number of subsequent instalments. Among these were a trilogy of legal-themed plays by barrister Nemone Lethbridge , and Charles Wood 's colourful 'Drums Along the Avon' (tx. 24/5/1967). In 1968 MacTaggart became one of the founders of Kestrel Productions , Britain's first independent television drama production company, and for them directed plays destined for London Weekend Television , notably Dennis Potter 's 'Moonlight on the Highway' ( Saturday Night Theatre , tx 12/4/1969). Kestrel Productions didn't last long and he returned to the BBC as a freelance writer and director in late 1969. The following year he gained his one big screen credit, directing All the Way Up , a comedy of social advancement based on a play by David Turner . In the early 1970s MacTaggart directed several instalments of The Wednesday Play 's successor, Play for Today (1970-84). Perhaps most notable of these were the unsettling 'Robin Redbreast' (tx. 10/12/1970) and 'Orkney' (tx. 13/5/1971), a trio of short dramas set and filmed on the Scottish islands. Also on a Scottish theme was the serial Scotch on the Rocks (tx. 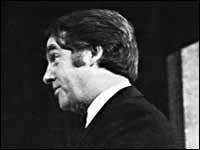 11/5-8/06/1973), a BBC Scotland production adapted by MacTaggart from a novel by Andrew Osmond and future Tory Home Secretary Douglas Hurd . The story depicted Scottish nationalism, fuelled by North Sea oil wealth, leading to violent insurrection. Although the serial was a futuristic thriller, it sparked some controversy and the BBC upheld a complaint by the Scottish National Party that it amounted to damaging propaganda against them. The advancement of electronic effects in the early 1970s allowed MacTaggart to expand his range of non-naturalistic techniques. Most notably, for 'Candide' ( Play of the Month , tx. 6/2/1973) he used the superimposition effect Colour Separation Overlay to position his characters against a variety of entirely artificial backgrounds, a trick he repeated on Alice Through the Looking Glass (tx. 25/12/1973). MacTaggart died suddenly in May 1974, aged 46, having just returned from filming in Tobago for 'Robinson Crusoe' ( Play of the Month , tx. 29/12/1974). Just two months before his death he had been awarded the Society of Film and Television Arts ' Desmond Davis Award for outstanding contribution to television, and he received the Press Guild 's equivalent award posthumously. In a tribute broadcast by the BBC ( In Vision , tx. 7/6/1974), his colleagues praised his technical brilliance and affinity with his audience. In 1976 he was honoured by the first James MacTaggart Memorial Lecture , given in Edinburgh by his colleague John McGrath on the subject of non-naturalistic television drama. The lecture was subsequently subsumed into the annual Edinburgh International Television Festival and continues to be given by the industry's key figures.